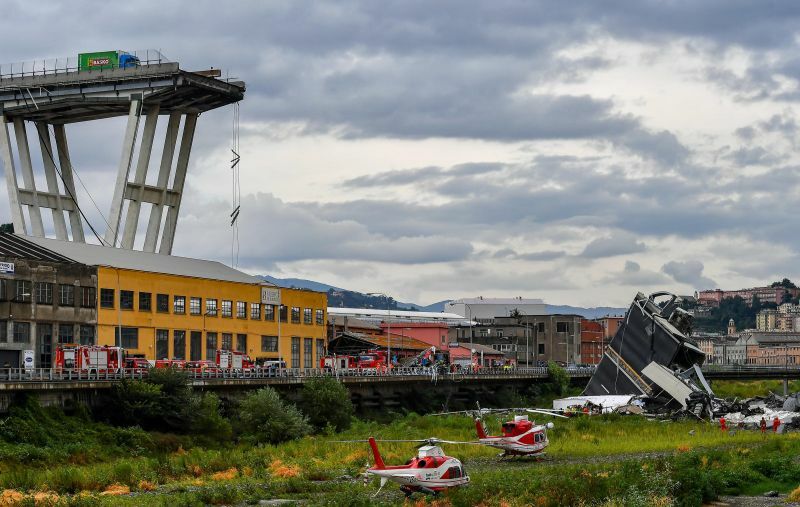 A frantic search was underway for survivors of a bridge collapse in Genoa as the death toll rose to 38 and the government blamed the company in charge of the country's motorways for the disaster. A vast span of the Morandi bridge caved in during a heavy rainstorm in the northern port city on Tuesday, sending about 35 cars and several trucks plunging 45 metres (150 feet) onto the railway tracks below. The victims include children aged eight, 12 and 13, Interior Minister Matteo Salvini said, adding that more people were still missing. The government said it intended to revoke the contract of Autostrade per l'Italia, a private sector company owned by Atlantia, and slap it with a fine of 150 million euros ( 170 million). Deputy prime minister Luigi Di Maio, who is due to arrive in Genoa on Wednesday morning, said the tragedy "could have been avoided". "Autostrade should have done maintenance and didn't do it," he said. Rescuers recovered three bodies overnight, fire official Emanuele Gissi told. Drone footage shows scene of catastrophic Italy bridge collapse that killed at least 39 people, including three children, as rescue teams search for survivors. AFP, after scouring the scene of devastation under floodlights. "All accessible spaces have been explored, now we are moving the largest pieces of debris," Gissi said. "We cannot know if there are survivors remaining, but it's our job to search." He added that two large cranes would be used in the operation, which is set to take days. Sources in the interior ministry told Italian media that 16 people were wounded, including 12 in serious condition. The collapse came as the bridge was undergoing maintenance work while the Liguria region, where Genoa is situated, experienced torrential rainfall. Italian President Sergio Mattarella said a "catastrophe" had hit Genoa and the whole of Italy. "Italians have the right to modern and efficient infrastructure that accompanies them safely through their everyday lives," Mattarella said. Aerial footage showed more than 200 metres (650 feet) of the viaduct was completely destroyed. Rescuers combed through the wreckage strewn among shrubland and train tracks, as helicopters winched survivors on stretchers from the rubble. A thousand people have been mobilised in the rescue effort, according to the Civil Protection service. As cars and trucks tumbled off the bridge, Afifi Idriss, 39, a Moroccan lorry driver, just managed to come to a halt in time. "I saw the green lorry in front of me stop and then reverse so I stopped too, locked the truck and ran," he told AFP. Some that plunged down with the bridge managed to escape unscathed, including a former goalkeeper for Italian Serie A club Cagliari. "I was driving along the bridge, and at a certain point I saw the road in front of me collapse, and I went down with the car," Davide Capello told TV news channel Sky TG24. The incident -- the deadliest of its kind in Europe since 2001 -- is the latest in a string of bridge collapses in Italy, a country prone to damage from seismic activity but where infrastructure generally is showing the effects of a faltering economy.